This member of the Daisy family is popular in gardens, but the only place we have seen it in the wild is in Bosco Quarto on the Gargano Peninsula in Italy. In the UK garden escapes of Doronicum pardalianches have become naturalised in areas of woodland and on sheltered roadside verges. The common English name for this plant is Leopard's Bane, and it is similar in appearance to Common Fleabane - Pulicaria dysenterica - which can be found throughout the UK except in Scotland. Common Fleabane can be an absolute pest if it establishes itself in a garden and is very difficult to get rid of once it has got a hold. The garden Doronicum, on the other hand, is much less agressive and sometimes quite difficult to get going. 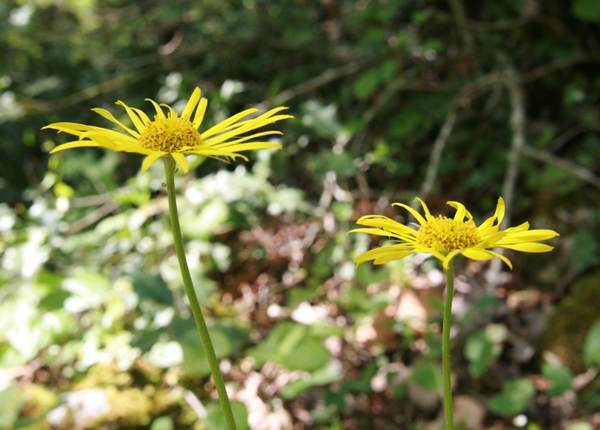 As always it is a pleasure to recognise a garden species as a wildflower when on holiday, and we saw quite a lot of Doronicum columnae when walking in Foresta Umbra in Southern Italy. The plants on this page were photographed in Italy on the Gargano Peninsula in April.